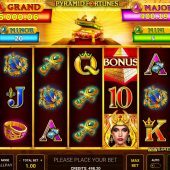 Pyramid Fortunes slot by Novomatic, or their in-house 707 Games team, is never going to prove to be as exciting or volatile as with Novo's other Egyptian themed games such as Pharaoh's Ring or any of the Book of Ra series like Book of Ra Magic or the old favourite Book of Ra Deluxe version. The graphics here are a little more advanced though with a torch-lit tomb lying behind the reels while we retain the old and familiar trotting sounds from the reels followed by some nice thematic music when certain symbols and wins appear. Yes, this Pyramid appears to contain many golden treasures but how much of our bankroll will be spent uncovering them? 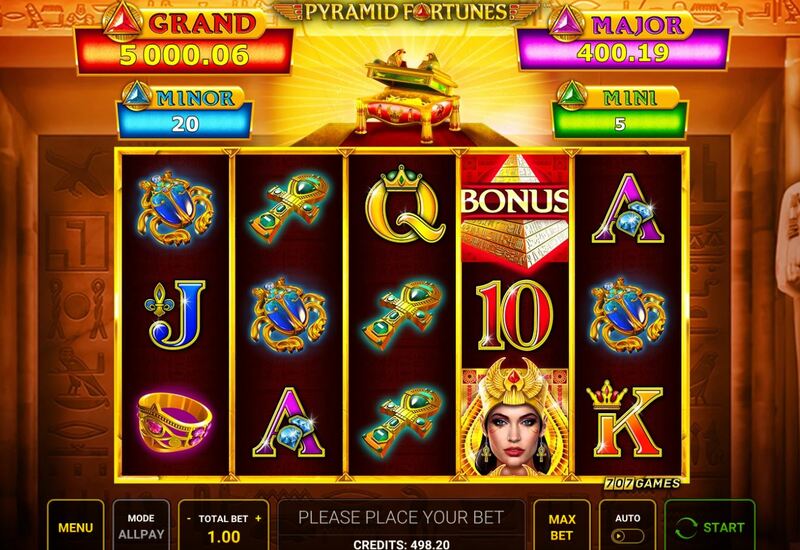 Pyramid Fortunes has 243 ways over 5 reels of 3 rows each meaning that there are no fixed pay lines. Alas this format usually results in low line pays and this is borne out by most the 5-of-a-kind awards. The Queen pays 12x, Ra Jewel 6x, Scarab 2.5X, Ring 2x and Ankh 1.2x with six card values all offering 0.5x. You see bonus pyramid scatters on all reels and Wilds only singly on the centre 3 reels with the one on reel 3 having a 2x multiplier if involved in any wins. Symbols can appear stacked though so potentially with the Queen or Ra Jewel you could get multiple ways and therefore a substantial win. I somehow doubt it though. Any Wild landing gets put in the Treasure Chest above the reels. On occasion this may open the Chest to reveal 12 tiles which you pick from repeatedly until you match 3 colours equating to either the Mini, Minor, Major or Grand jackpot. You need 3 or more scatters on consecutive reels from the left. Luckily the Wilds do substitute for the scatters too so this may not be as hard as you imagine. You have 10 free games which can be retriggered. Your enhancement? The card values are removed from the reels, which to be fair usually ensures a decent overall total from the spins.